Promotional items are a great way to promote your business, team, private organization, or any other group! They make excellent employee reward incentives, tradeshow give-aways, fund-raisers, company store items, corporate branding efforts, wedding favors, gifts, etc. They are also an excellent way to memorialize a special event or that special person in your life. 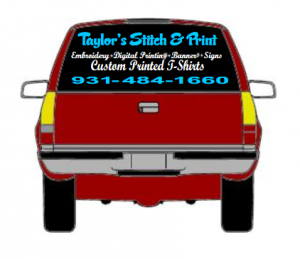 Taylor’s Stitch & Print will ensure that your business cards, custom decals, stickers t- shirts, signs, and banners are produced to your speciﬁcations! Below are some samples of our work for you to check out. We believe you will be completely satisﬁed with our work. Contact us at 931-484-1660 or contact us for more information.